Daily Interest Calculator This compounding or simple interest calculator will help you to calculate and track the accruing interest on an interest-bearing promissory note or personal loan. The calculator allows you calculate daily interest between dates or for a specified number of days, and allows you to create a schedule of interest accrual periods for keeping a running balance over time, including rate changes and increases and decreases to the principal. Also includes a printer friendly report so you can just start from where you left off on your next visit. Note that you can change these starting variables and preferences at any time, as the changes will automatically recalculate the loan schedule. Optional: Enter the name of the loan as you'd like it to appear on the printed loan periods report. Enter the beginning loan amount, without the dollar sign or any comma. Enter the starting annual interest rate expressed as a percentage, but without the percent sign (for 6.5%, enter 6.5). Select the month and day, and enter the 4-digit year of the date this loan will start accruing interest charges. Select either Simple Interest or Compounding Interest. Simple Interest will not add period interest to the principal, whereas Compounding Interest will add the daily interest charge to the principal on a daily and period basis. Select the number of days per year you would like the calculator to use for converting the annual interest rate to a daily interest rate. 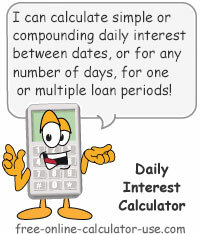 To calculate the interest for the period, be sure you have entered the starting amount, rate, and date (including the 4-digit year) in the top section, then complete the required fields (ending 4-digit year and number of days in period) in this section, then click the Calculate Daily Interest button. If you will be entering more than one interest period, be sure to enter all periods in the order they occurred, from first to last. If the borrower made a payment on the loan, select Decrease from the dropdown menu and enter the amount of the payment. If you loaned the borrower additional funds or you need to assess a late penalty, select Increase from the dropdown menu and enter the amount to increase the principal by. Otherwise, if no loan adjustments occurred in the period, leave the field blank. Select the month and day, and enter the 4-digit year of the date this loan period ended. If you entered a date in the previous line, the number of days in this interest period will be calculated for you. Otherwise, you can enter a number of days in this field and the calculator will update the month, day, and year in the previous line for you. If the rate charged for this interest period is different from the starting rate, enter the new rate on this line, but without the percent sign (for 6.5%, enter 6.5). Otherwise, if you leave the field blank, the calculator will use the starting rate for this period. This is the amount of the interest that has accrued between the starting date (or the last entered period date) and the ending date of this period. This is the loan payoff amount (principal plus accrued interest) as of the ending date of this period. This is the daily interest rate being applied for this period. This Daily Interest Loan Calculator will help you to quickly calculate either simple or compounding interest for a specified period of time. You can either calculate daily interest for a single loan period, or you can create a loan schedule made up of multiple periods, each with their own time-frames, principal adjustments, and interest rates. Plus, you can print out a copy of the running balance schedule so you can just start from where you left off on your next visit. All these features make the calculator ideal for tracking personal loan interest, promissory note interest, or other types of owner-financed, interest bearing notes. I need a simple interest, daily accumulated interest to do a running balance due including principal. Spreadsheet? Example, I loan a customer $13,000.00 on a note, 10% annual (360 day) simple interest. The loan is usually secured, sometimes not. Generally these are 6 month notes but due dates are not important. No regular payments, monthly or otherwise. Here is what and where I need help on. At some point in time my borrower may send me a payment of $9,050.00 which is applied to the note and then 2 months later borrows $2,750.00, increasing the note. Then the next month, the borrower sends me $500.00 for the next three months running to be applied to the note. I love getting those kinds of emails! They get my wheels turning and allow me to serve others through a work I love. Enter the loan name (optional), starting amount, starting annual interest rate, and starting date. Select either Simple or Compounding interest, and either 360, 364, or 365 for the days in the year. If a principal adjustment occurred (payment or additional funds borrowed), select either Decrease or Increase and enter the corresponding amount. Enter the period's ending date or specify the number of days since the start (or last period) date, and then click the Calculate Daily Interest button. If you are creating a schedule of periods to track the note's running balance, click the Add Period To Loan History button and repeat the period entry process for each interest period you wish to add (be sure to add periods in chronological order, from first to last). Click the Printer Friendly Report button to print out the running balance schedule so you can start from where you left off on your next visit. Now, if you're like me, and need to know what's going on "under the hood", here is how I set up the calculator to calculate daily interest. Since we're calculating simple interest, the $246.60 is not added to the principle for any subsequent periods. Since we're calculating compound interest, the $249.54 is added to the principal for the next compounding period.